Roger Federer has moved through to the third round of the US Open in a canter, making light work of Steve Darcis 6-1, 6-2, 6-1 on Thursday night. The five-time champion needed just 80 minutes to see off the Belgian’s challenge on Arthur Ashe Stadium and has not been broken now in his past 72 service games. Coming into his first career meeting with his 31-year-old opponent, Federer had claimed his seventh ATP Masters 1000 Cincinnati title. After his first-round victory over Leonardo Mayer at Flushing Meadows, he has now won his past seven matches. “I was able to mix it up, was attacking, was also staying back some. 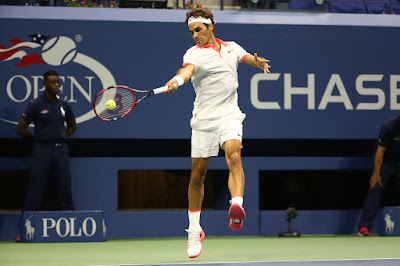 I was pretty much all-out attack as much as I could,” Federer said. “Obviously I have to manage that against different players when the scoreline isn't maybe so one-sided. “Very often I started this tournament quite strong. It's always gone quite well for me," said Federer. Federer finished the match with 11 aces, winning 86 per cent of first-serve points and clocked 46 winners to Darcis’ eight. He won 19 of the 29 points he ventured to net. The mix of serve-volleying and chip-and-charging was a tactic he had brought back to his game. “It would be nice to see more players doing it ’cause I think the mix of the different players and characters of those kind of players makes it cool and fun to watch,” Federer said. “Not that these unbelievable baseline rallies are not cool, but it is nice to see a guy at net and a guy trying to pass, a good net player. It's always been a fantastic thing, like Sampras and Agassi is one of those classics, or McEnroe and Borg. It was epic to watch those guys play against each other. Only twice had Darcis beaten a Top 10 player in the ATP Rankings - Tomas Berdych at the London 2012 Olympics and his most famous win against Rafael Nadal at Wimbledon 2013. Federer would not be his third on Thursday. It was uphill from the get-go. Darcis was broken three times to concede the opening set in just 22 minutes. Forced into error on the forehand side he relinquished the double break in the second to hand the World No. 2 the set, 6-2. In cruise control, Federer ran away with the third set, sealing the match with a forehand winner to set up a third-round meeting with No. 29 seed Philipp Kohlschreiber. The German posted a comprehensive 7-6(4), 6-2, 6-2 victory over Czech Lukas Rosol. Kohschreiber hit 29 winners and won 84 per cent of first-serve points in the 113-minute encounter. He has never beaten Federer in nine previous attempts.